And now the CHF 2014 awards presented by Chris Jordan. This year I nominate myself and humbly accept the award for best dressed. The holes in the clothes, the hair that says, “I’m already married.”, the too much stuff being carried to show off for my wife. Oh yeah. Winner. Of course I’m kidding. Julie wins any beauty pageant. Even if she doesn’t try. Here she is not trying at Aunt Marian’s birthday party. Isn’t she pretty? What do pigs do on a farm? This one wins every year. Talk about SEO. Sheesh. I’ll tell you what pigs do. They escape and come looking for me…the guy who brings the food. The Way I See you, The Way I Love You. Read it for yourself. We love our new chicken house. I can’t say enough about it. We have lost ZERO chickens to predation, it kept the birds cool and comfy in the summer. 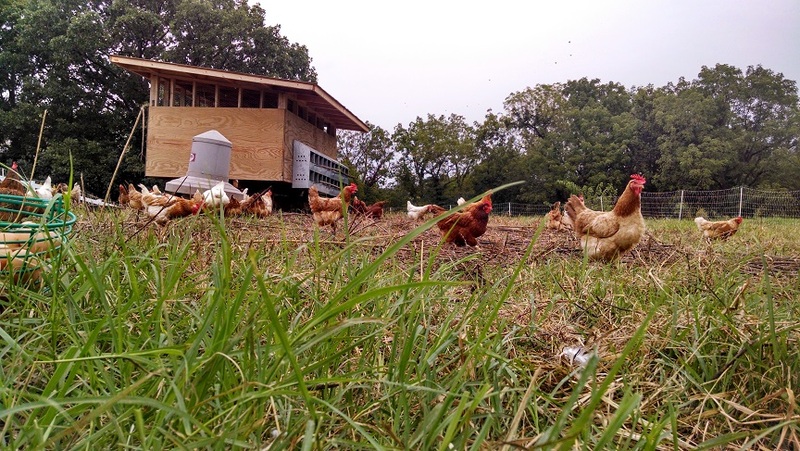 Egg production stayed high all summer. We captured manure in the bedding on the floor we could redirect to specific locations on the farm. It’s easy to move on down the road. Just great. I would make two changes to it though. The next one will be a little taller and four feet longer. And the nest boxes will be on the other side so we don’t get dripped on. Other than that…great. 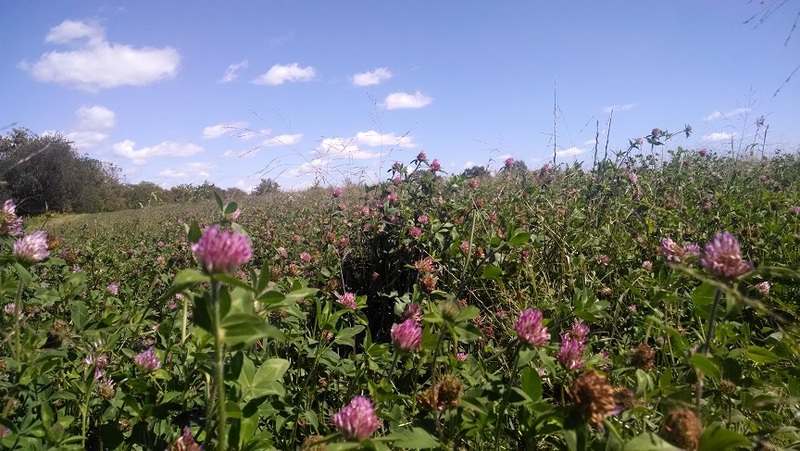 With a minimum of effort and expense and against my wishes, dad single-handedly and somewhat magically converted a field of corn stubble into a magical land of clover (and weeds). We cut it for hay then, later, we grazed our way through. 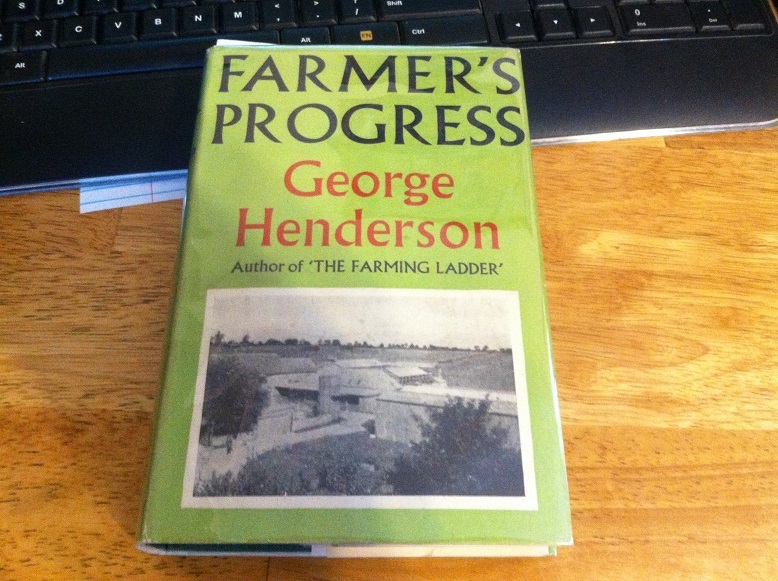 I must have read The Farming Ladder 10 times this year but, in spite of that, I think I liked Farmer’s Progress better. What a great book. Well, that and Carry On, Jeeves. But please, let’s don’t think I’m an anglophile. 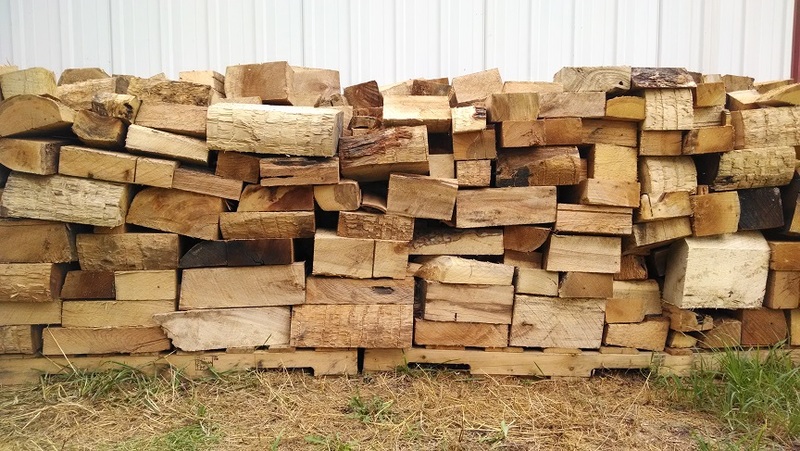 We bought a truckload of oak odds and ends from the local sawmill really just for the price of the hauling. This isn’t all of it. This is a nice picture Julie snapped for ..like..art..stuff. What a great year. 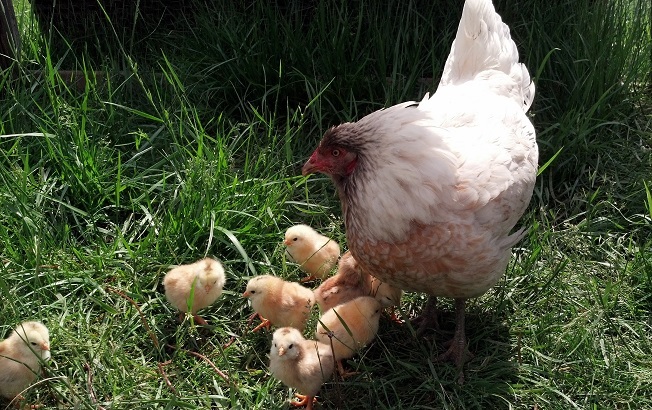 We had a hen go broody and hatched chicks we weren’t expecting. 5 calves were born with no problems at all. We raised pigs, we raised chickens, we had fun. But you know, sometimes things just don’t make it on the farm. It’s a hard place. We lost a calf this year. That was pretty hard. A mink killed 12 ducks one evening. My youngest’s favorite cat got hit by a car. That was rough. There were also whole litters of kittens that didn’t survive. We really thought Horatio was going to pull through but another, older kitten took his mama’s milk. My oldest daughter took it pretty hard. But that’s just how it is. Animals have a hard time. 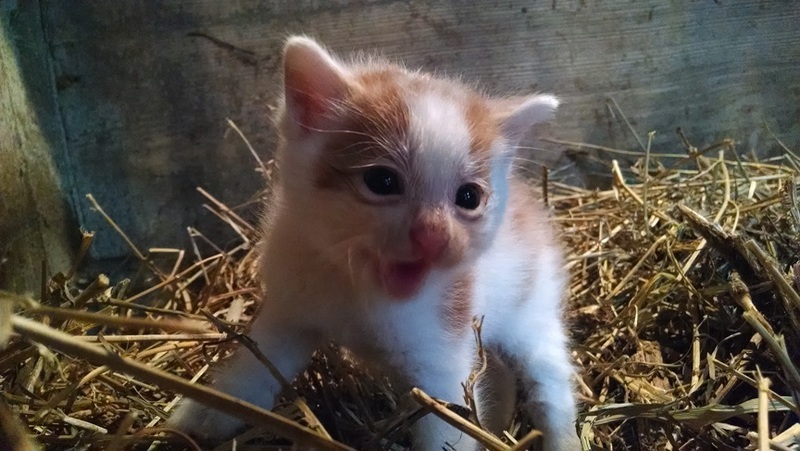 Especially the semi-feral barn cats. Most especially the semi-feral barn cats we name. Julie doesn’t want to milk. Every. Stinking. Day. Aunt Marian was suddenly gone. One day she was peeling grapes at her sink. The next day she was in the hospital. Within a month we were remembering her life. 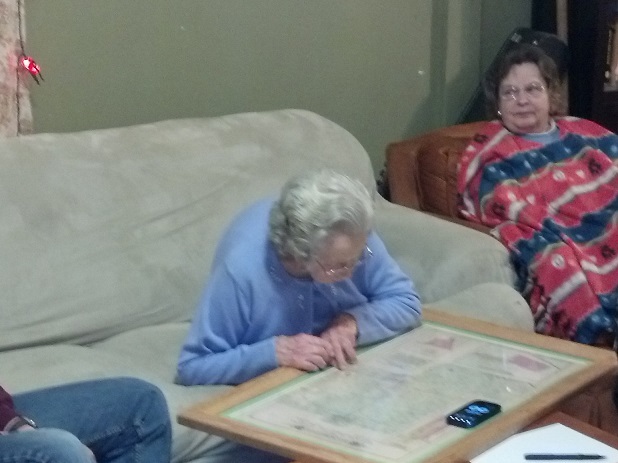 At a birthday party this year she looked at a plat map with me. The map was from 1893 but farms don’t change hands frequently. She told us what she remembered about each farm, where the house was, how folks were related. She knew everything. We miss her every day. So that’s the year in review…awards for 2014. Some of that was pretty rough but we’re ready for more. Aunt Marian won’t fall asleep in a chair at the next birthday party but we move on. There are eggs to collect, cows to milk and calves to tag. There are children to raise. So here’s to 2015. We pray that God will enlarge our borders and keep us from harm. One additional note, most of the pictures in this post were taken with Julie’s MotoX and are untouched. The old MotoX not the new one. That may be something we wonder about some day. I doubt a reader cares though. Indoor shots seem to suffer with that phone. 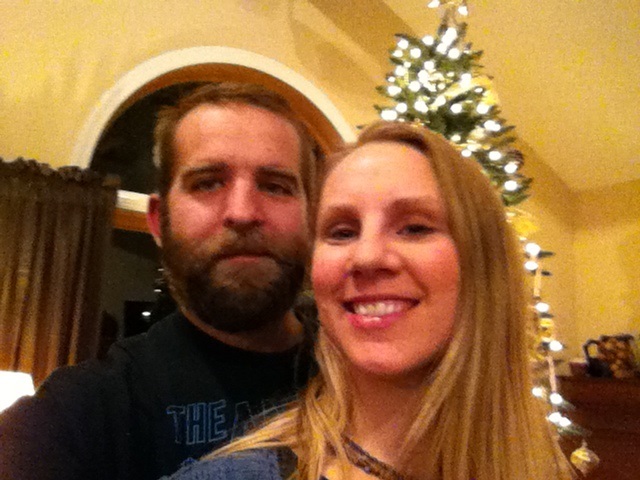 The bearded Christmas selfie and the picture of Farmer’s Progress were both taken with my iPhone 5C…my employer’s iPhone 5C. Should I Even Own a Small Tractor? I have no idea. Are we clear on this? No. Idea. I am massively conflicted on this post. Not paralyzed to inaction, just conflicted. Let’s start at the beginning. I bought an Oliver 550 on CL in May of 2010. Good rubber, soft clutch, weak brakes. SO I bought a new exhaust manifold and an aftermarket drawbar kit. And a new PTO shaft…because…why not? Perfect. Just perfect. The tractor really comes in handy raking hay, pulling hay wagons or pulling a trailer full of firewood, chicken feed…whatever. It’s a perfect utility tractor. But then it died. Dead. Wouldn’t start. Turns out it had a bad coil but it wasn’t just a bad coil. The tractor ended up at a reputable shop in town. Guy told me he couldn’t get it to show any oil pressure. The top end of the engine looks good but the bottom end needs rebuilt. I don’t know. Machine shop technobabble. Crankshaft. Bearings. Oil pump. Stuff. $1,400 worth of stuff. I press down the clutch to stop behind the truck but nothing happens. Tractor keeps moving. I frantically shove the tractor out of gear before something bad happens. But something bad already happened. The clutch had blown apart. The tractor then sat in a tractor cocoon in my machine shed for nearly a year. Should I just cut my losses and sell it for scrap? There is an Oliver scrapyard an hour south. Maybe they will give me something for it. Whatever. I obviously don’t need this tractor since I haven’t used it in a year. November rolls around. The tractor dealership shows up with dad’s loader tractor. The guy peeks in the shed and asks about the tractor. Dad explains, the guy offers to fix it and the tractor goes down the road. How much does a new clutch cost? $1,800. 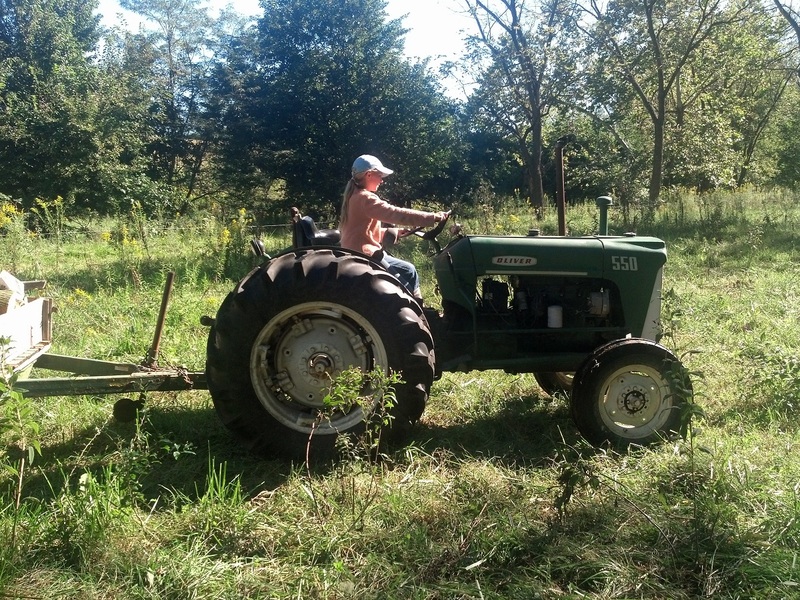 That makes my $3,500 antique tractor perilously close to a $7,500 tractor…minus the usage we have gotten out of it. A similar new tractor, though one with a loader, costs somewhere in the neighborhood of $25,000. At 4.5% interest that’s $4,000 each year. So I could have had a small loader tractor for two years instead of this one for 5. But the new tractor would have a loader. Point to the new tractor. The Oliver is mechanically simple. No computers. All standard bolt sizes. Few wires. New tractor comes with a warranty. Yeah, but why do I need a tractor at all? I mean, really, why? And that’s where it sits. I own an Oliver 550. It’s great at what it does. It’s not heavy enough to pull small trees out of the ground but perfect for pulling chicken houses, hay wagons, etc. I would like to have a new tractor but…I mean…if I keep replacing parts I will have a new tractor…lol! So, to the fella who came by unexpectedly last week to look at the tractor, wanna trade for bred cows? 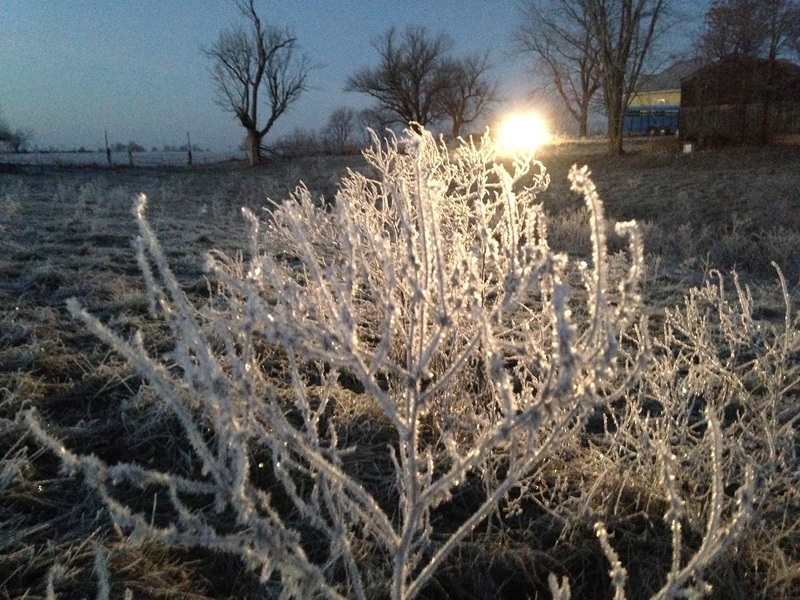 Was out working before sunrise and didn’t really notice the frost until the first rays of light revealed it to me. 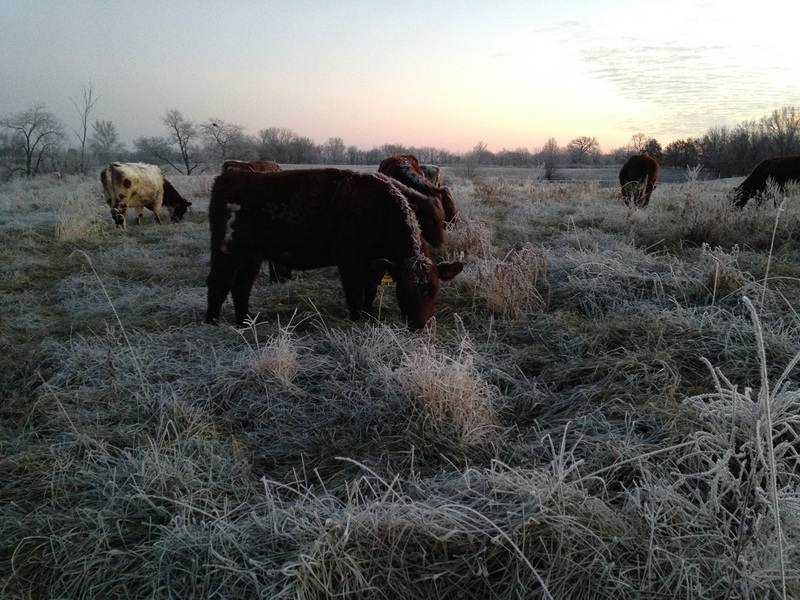 Frosted grass, frosted weeds, frosted cows. It has been rainy and wet for the last week and it made for a beautiful morning. 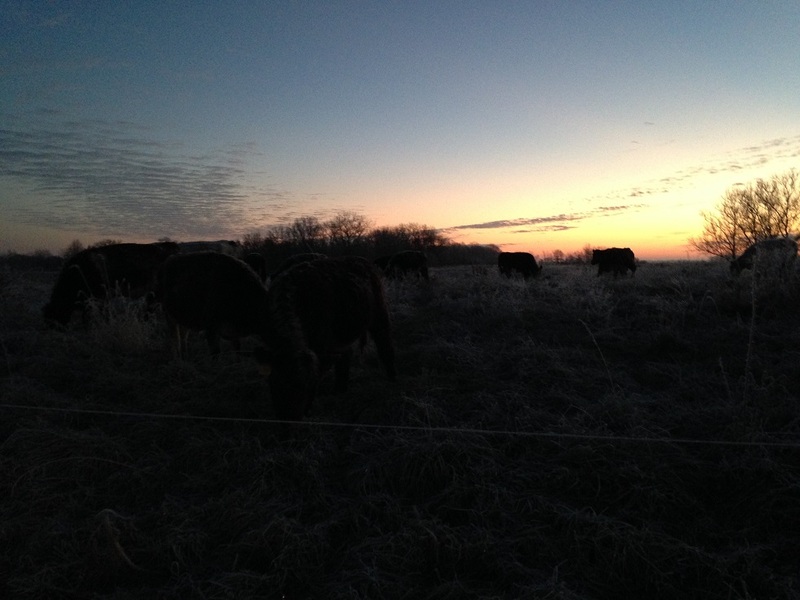 I turned the cows into a new grazing area as we do every morning. I think we still have 30 acres of standing forage to munch through. The shorthorns seem to like it. The Jerseys nibble a little but they know hay is coming. I brought them a few forks of hay off of a round bale. I prefer to feed hay this way. I can sort the good from the bad (bales are pretty bad this year) and they don’t turn the whole bale into a bed. Very little waste this way. 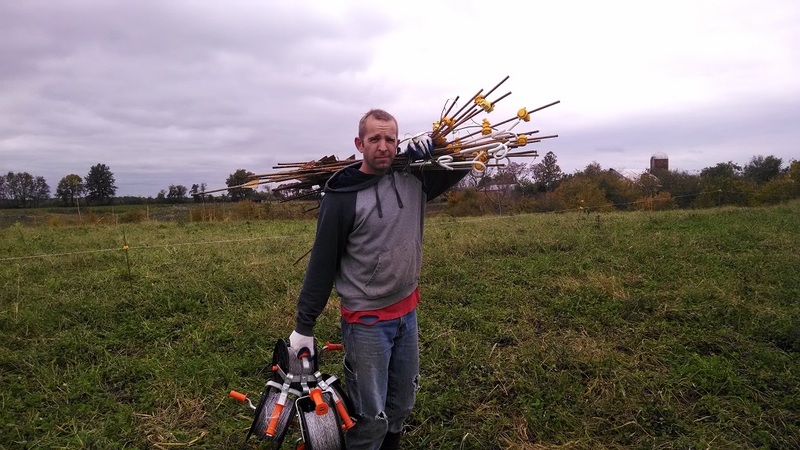 I just carry each forkful to a clean spot in the pasture as I cross over the perimeter fence. 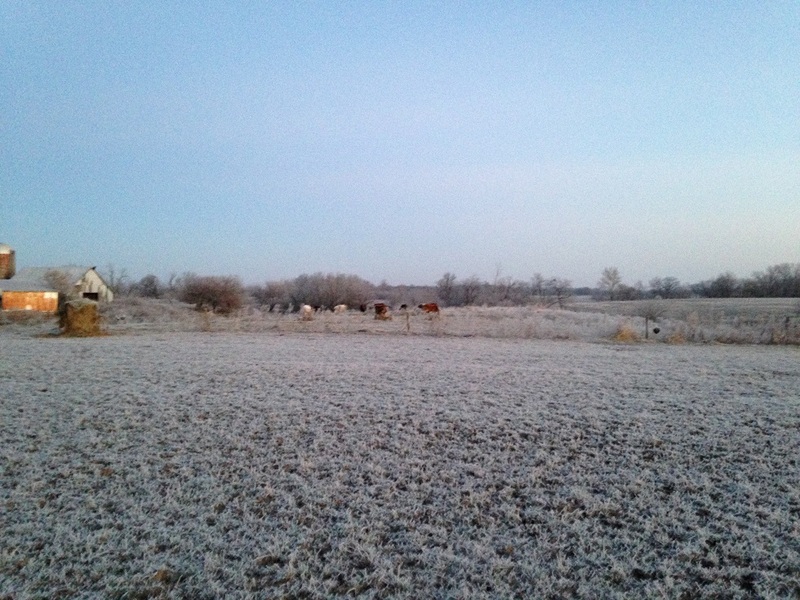 Maybe you can’t tell but the cows have grazed the pasture in the foreground pretty hard. 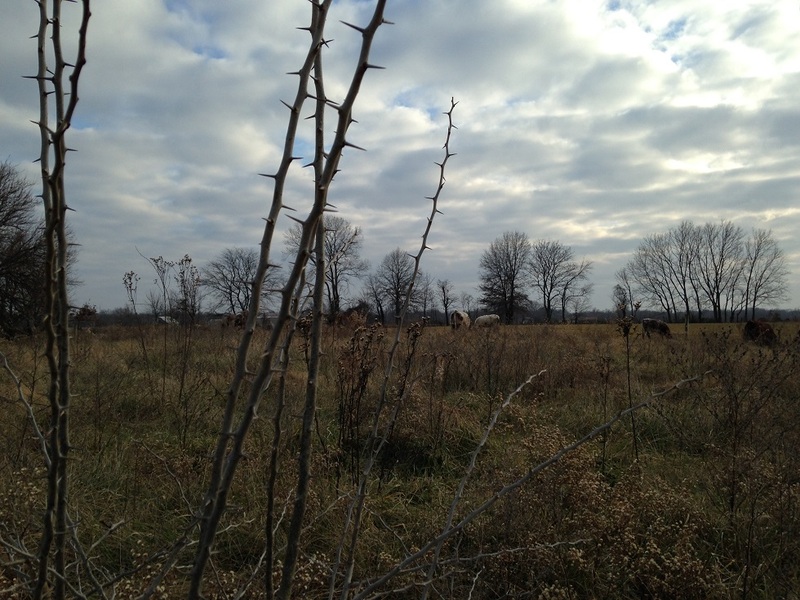 I’m leaving a lot of brown forage behind to protect and feed the soil as well as a couple of standing weed skeletons. What a beautiful morning. The sun will be up soon. I have no idea who Susan A. Chism was. Only this bit of information I got from mom’s blog. Brace yourself. 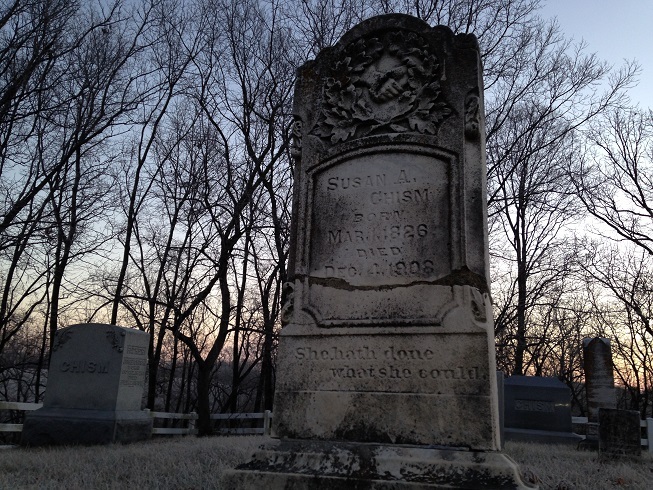 Susan was the blind daughter of William and Sarrah W. Chism. The story is she was carrying scissors and fell. Don’t run with scissors, kids. I guess I know a little more. Susan was the daughter of William and Sarrah. William and Sarrah were my grandpa’s great grandparents. And I guess they lived here..or near here. Uncle Jack said there was something of a rift torn between family members and between neighbors when Susan sold a portion of the farm. I’ll come back to that. One reason I know so little about my great, great, great, great aunt is because there were no blogs. Ever wonder why I blog? Maybe part of the reason is because I don’t want to be forgotten. What will my great, great, great, great nephew know about me in 100 years? Today I will write a letter to that generation…assuming the internet archive will still be available at that time. Who knows though. This may be the Betamax version of the internet, soon to be made obsolete. (I’ll include a link to explain what Betamax means. Kids today…) Back on point, what did I inherit from Susan A. Chism? What vision did she cast into my life? Heck, what vision did grandpa cast into my life? That’s hard to pin down. I live in my grandpa’s house but I lived 100 miles away from here until I was almost 17. Grandpa died when I was 21. How much did grandpa teach me about farming? Not much. How much vision did grandpa share with me? What legacy did he leave? Grandpa was always pushing to recognize, learn and embrace new trends and opportunities in agriculture. He loved us unconditionally. I remember grandpa laughing and smiling. I remember the last conversation I had with him, across the room from where I sit as I type this. I asked him if I could name my first son after him. He said he hated the name Chester then laughed. With that out of the way let’s begin casting vision into the generations to come. I have the chance to do something Susan A. Chism couldn’t. I have so much to say to you I hardly know where to begin. I want to keep this letter focused on a main theme but I have to touch on one other thing. Never sell land. That was reinforced in a book I’m reading about the King ranch right now and also in the story uncle Jack told me about my great (x4) aunt Susan, (not his wife aunt Susan). There are a good number of you children I have never met. Or if I have, I don’t remember it. Julie and I brought four children into the world. Our plan was to have six but…well, plans change. You, my children, are my treasure. The land, chickens, cattle, books? Worthless. They can all go. They don’t matter. You matter. You, children, are why we are here. Do I have land so I can have cattle or do I have cattle because I have land? I don’t know. I do know that the land and cattle are an enhancement to our lives together. I have them because I have you. However, I hope you make time to read the books. I know they are old-fashioned but they offer you a way to connect with your grandmother and me. I hope some of you own books that I owned, as I own books that aunt Marian owned. 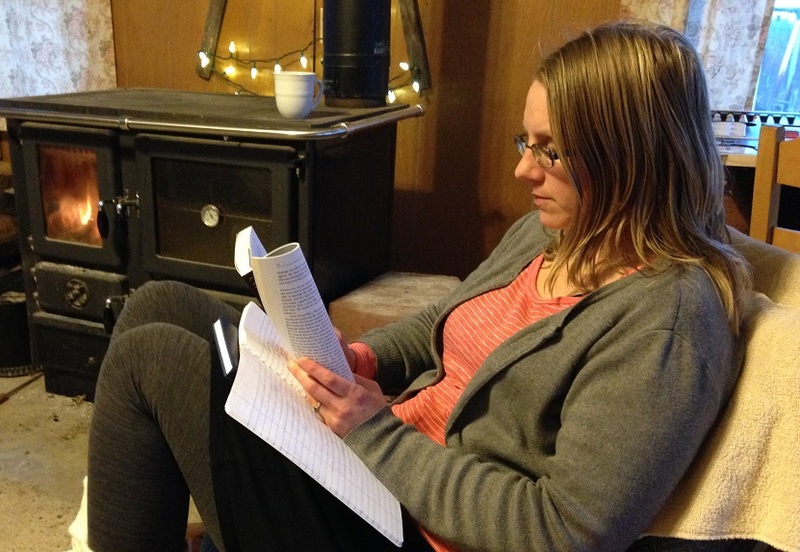 Julie and I along with our four children (currently aged 8-14) sat around the fire during a snowstorm reading on a Sunday at Thanksgiving. It was awesome but not unusual. We love books. But we love you more. You may not believe it but I was once young and had a sense of humor. As we said then, “I know, right?” One favorite joke was writing under the pen name Head Farm Steward. As we said then, “LOL!” I’m not the head of anything…maybe the labor department. The farm doesn’t have a head. It has a team. That joke was originally sourced from a series of books about a cowdog named Hank, the head of ranch security. Within the next two years, my oldest son (your uncle, great-uncle, great-great-uncle, father, grandfather or great-grandfather) will have the opportunity to call himself by that joking title. Should he choose to accept I will relinquish the title and crown him the new Head Farm Steward and devote more of my time to composting animal manure or writing more on the blog…but I repeat myself. I hope one or more of you have continued that tradition. With luck, one of you has given the title meaning…you are actually the head of something. Maybe 20 of you have land of your own and work to coordinate your methods and marketing, expanding our vision into a vast family empire. We are counting on you or your spouses to do just that. To what extent have you succeeded? What is the next step? Somebody speak up. We are counting on you. And why, you ask, do I want you to own land? Read Gone with the Wind. Let me spell it out. 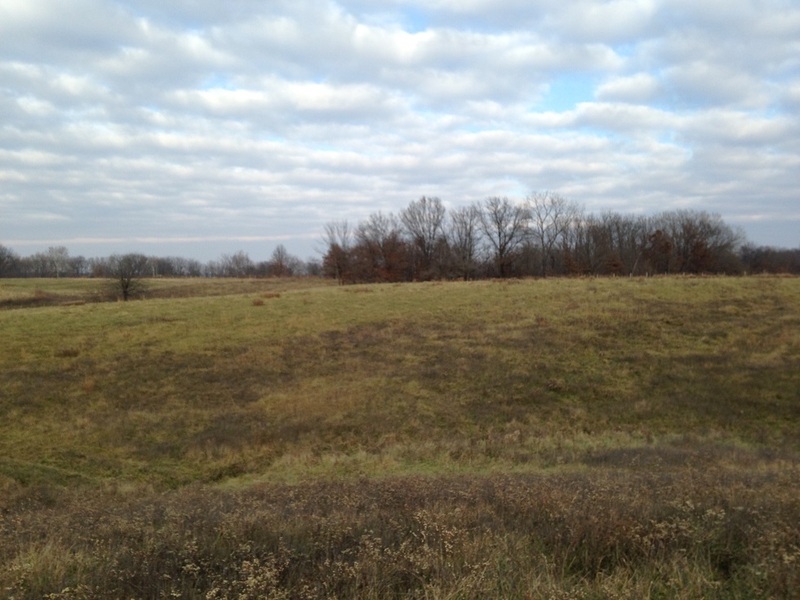 Land is worth owning. 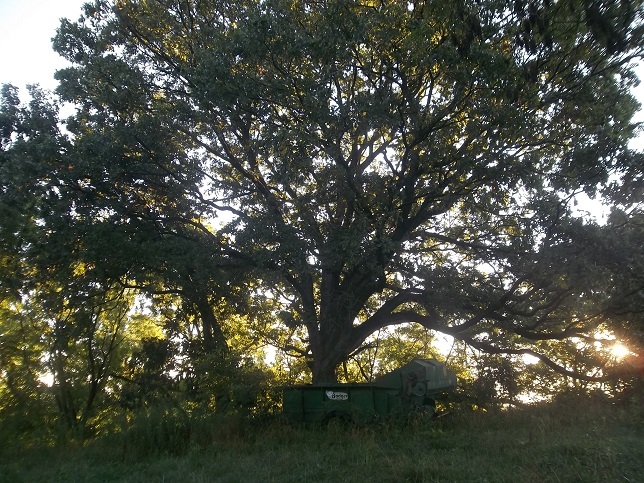 Land gives you a tie…a place to put down roots. A home. Sentimental attachment. There is a giant tree on the next hill over that my grandpa said was was big when he was a kid. That memory spans the years. Land spans the years. Land carries wealth through the years. Land gives you the option to produce something. You can plant. You can tend. You can harvest. You can eat. You can pay your taxes. But back to the theme, you can build memories with your children. You can shoot at targets, you can identify frogs and snakes and birds and spiders. You can learn and work together. If that’s not enough, there are any number of places we could put our money but land offers a measure of permanence. You can’t drink it. You can’t eat it. You can’t burn it. It remains. I hope you are all land owners, wherever you live. I hope you use your land to be productive, not simply for recreation. Not simply lawn space. I hope you are good stewards, working to multiply your blessings within your community. At age 8 I really didn’t understand what grandpa was talking about. In fact, at age 90 I’m still not sure. But I remember his laughable efforts to say something profound each day. Do you appreciate your children? Are children a burden or a blessing? What are you teaching them about themselves? It doesn’t matter who they go to for their three R’s, they learn more from you. Do you love them? Do you know them? Do you know how they want to be loved? Find the book The Five Love Languages on my bookshelf. My grandma left red lipstick on my face in trade for cookies. Grandma Chism was all about physical affection. My great aunt Marian was into giving gifts and found joy in making clothes and food every chance she got. My father was less into snuggling and more into helping. Acts of service define his caring. Julie is all about the quality time. But you know what means the most to me (today anyway)? Words of affirmation. I need to hear them. I don’t want to be left to assume I’m an idiot. I want to be told there is hope for me. That God has a plan for my life. That I was created for a purpose. Take a few minutes to learn how to love each other…to learn how to be understood. Beyond that? I don’t know. The farm is home. Whatever else happens, wherever else we (you) go, this is home. We (you) are safe here. We (you) have purpose here. I am planting trees you will harvest from but that’s not the real harvest. You are the real harvest. I have cows for several reasons. First, I think I can get a better return on my investment in cattle than I can from a savings account. Second, it’s something to do with the kids. Third, I feel can make a small contribution to making the world a better place with cattle, both in terms of food quality and in terms of environmental quality. But look at #1 and #3 again. Those are about you kids. Why do I want money? To further our family’s intellectual and emotional development. Why do I want a better environment? Did you really just ask me that question? What kind of world do you live in 100 years from now? I live in a world of muddy rivers and dead zones in the gulf of Mexico. I live in a world that punishes people who save money…who accumulate wealth. We look down on intelligence. We scoff at people with more than two children and “support” our kids by watching them play soccer. Heavens! we certainly don’t play soccer with them. No. We stand around with the other parents while our kids stand with the kids. One must respect the class system. Kids go to school, adults go to work. That’s the way. That may be the norm in the outer world but it is not the norm in our world. You are our world. You are with us. You want to play legos? I want to play legos. You want to finger paint? I want to finger paint. You want to build a go-kart? You want to build a robot? You want to build a robot that builds go-karts? I’m game. Let’s go now because in about an hour I have to move the herd. Want to come with me in the helicopter? We are a family. We are united but we are not the same. We are not all interested in the same things. But we share a common goal: family. We do different things but we share resources. Your kids want to go to college? Ask the family counsel for financial assistance. You need to take a few weeks off to heal up or to write that book you’ve been meaning to write? Let us invest in you. Turn to us for help…then help when it is your turn. I’m not really planting trees. I’m planting you. I’m cultivating your lives. The cows just keep the wheels turning as we explore the world together. As we find out who we are. As we struggle against division. And I hope that is what I have left you. Unity. Family. Vision. Maybe some measure of finance but you are the real wealth. Julie and I treasure you. Each of you. All of you. We love you. Since I have the floor I’m going to say it all again. If I had nothing else I would have family. If I had my family and could have one more thing it would be a book. If I could add to that it would be a warm place to read a book. Growing from there I want a garden. But the garden isn’t big enough. I need an acre. Or two. Or twenty. But only if I can share it with you kids. I don’t know anything about my great, great, great, great aunt Susan but I will. Just as I am fully known. We are eternal beings and I hope to see you all soon. I recently shared that we decided to wean our calves. I have mixed feelings about this even now but it’s where we are. In short, May was having trouble maintaining condition with a calf at her side. So we separated the calf and all her siblings. I outlined this recently by sharing that we were attempting to use weaning clips and now it’s time for the rest of the story. 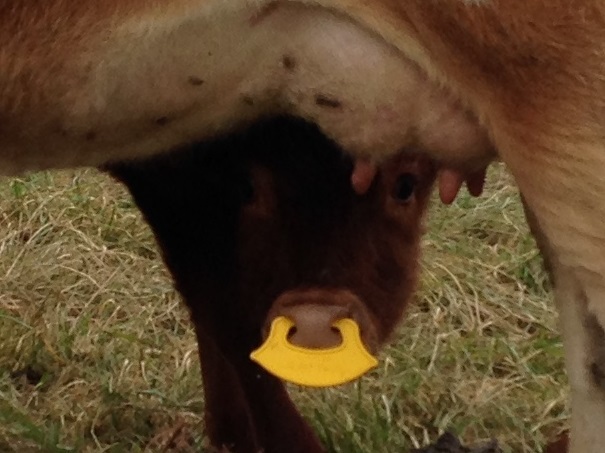 Six days have passed since we put the clips on the calf noses. It worked. Wonderfully. The end. The clip was clearly a source of frustration to the calves but they stuck by mama’s side and dealt with it. Now the small amount of bawling we hear is just that they miss mom. We did notice one limitation to using the weaning clips. The calves couldn’t lick their noses. Snot. Lots of snot. I had Julie remove the clips. So now the calves are in jail. They are under shelter on warm, dry bedding with plenty of fresh water, kelp, salt, hay and a southern exposure. They seem to be doing well. Once in a while one of them (I haven’t paid much attention which) will call out to mom. More frequently moms will call out to calves. I suspect they want to be indoors with all they can eat hay too. The fences, gates, the watering places, the sets of pens he had built were all the best, the most durable – sometimes overbuilt – to cut repair costs and maintenance time. That certainly applies here. What an asset that building is. More than half of the panels are gates. The chute below leads to a loading chute or gives access to two different lots…or, of course, the head gate. There is even a hydrant behind a wooden panel at the end of the chute. I would prefer, as others have suggested, to wean across a fence but in December with rain and cold weather in the forecast I feel better with the calves under a roof. There is enough stress as it is. Gee, Julie! What do you want to do in 2015? Bruce King beat me to the punch on this post and good for him. I don’t always make time for Bruce but I suspect I should. Bruce is a pragmatic farmer. He’s not afraid of the numbers. And he’s not afraid of work. But I feel like his 2015 post is missing something. Can I say that without criticizing Bruce? Because I don’t mean to criticize Bruce in any way. I just like a little more heart sprinkled into my writing. I need more than just “What”. I need to know why. Why does Bruce want to go from 20 cows to 30? Is it really just a numbers issue? A cashflow problem? Does it satisfy some yearning within him…some intangible desire to own 30 cows…the innate need to farm? Does it answer some insecurity he is wrestling with? 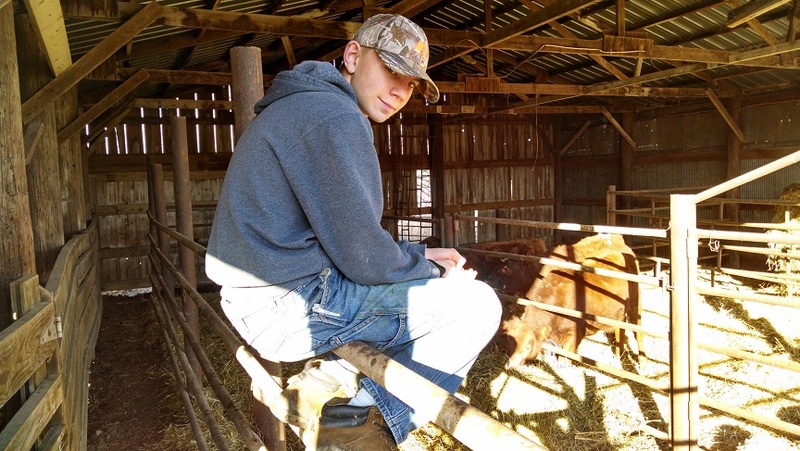 Does it solve a portion of his farm’s fertility issues or utilize a resource that is otherwise wasted? Has he increased his farm’s cow capacity by 50%? I don’t know. He just wants to go from 20 to 30. Well, good, but how can I personally apply this? What does it mean to me that Bruce wants more cows? I ask because I’m reading to learn. 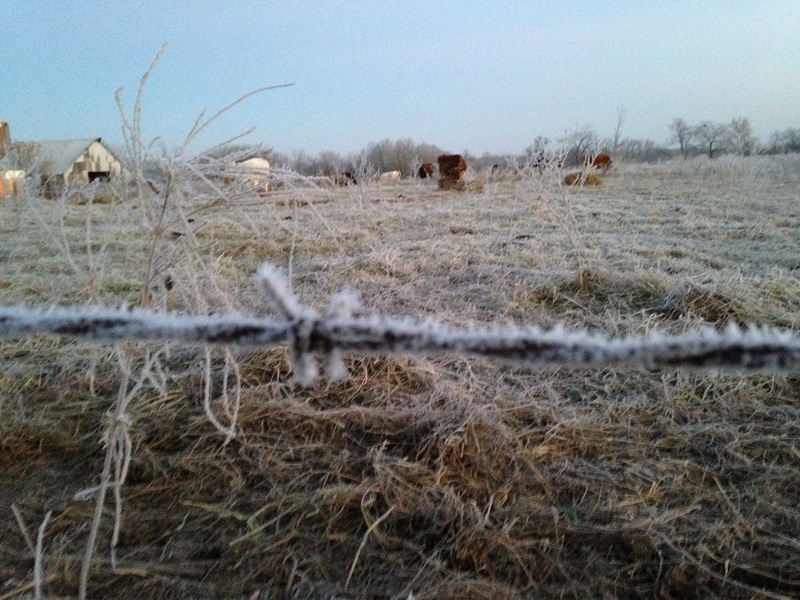 I have a small herd of cows and maintain a maximum of 200 layers. We run batches of up to 6 feeder pigs through at any given time. Those numbers are dictated by a number of factors including our ability, our marketing reach, our farm fertility and our time. It would be AWESOME to have a flock of 3,000 layers (our legal limit) but what would I do with all the eggs? How could I handle the feed? Where would I put them? The money would be great but…I just can’t. I can’t. Not yet anyway. I think it’s cool that Bruce can outline his goals in such a clear and concise manner. I’m afraid I fail at that task. Julie and I take our annual goals seriously…if we don’t know where we are going we won’t know when we get there. 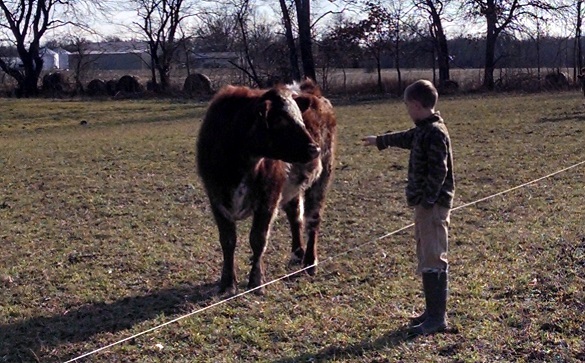 I’m not willing to share our personal goals on the blog but we do have farm and business goals. Now how to articulate them? Let’s start with what I want. I’ll write this with more Bones and less Spock…more feeling and less math. I want to make a bunch of money while also making as many people as possible happy and healthy. I want to live in a beautiful place, surrounded by abundance. I want to share that with others. If that means cows, then cows it is. Pigs? Chickens? Go get ’em. 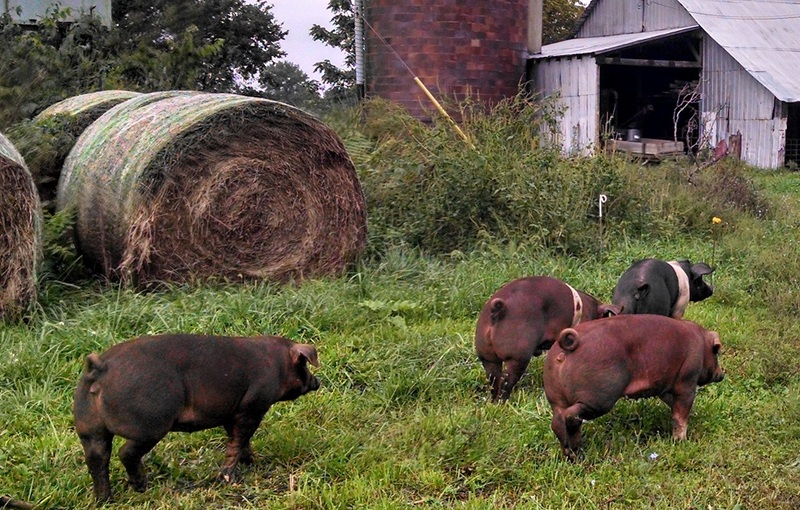 In fact, I feel my days are better when I have a variety of livestock around…less so right now without pigs. But on another scale entirely are my kids. I’m so happy to have children. I hope they are happy to have me. I hope I can provide them with a safe place surrounded by health and learning…the kind of place they will want to share with their own children. So that’s what I want. What can I do in 2015 to help me get there? I’ll try to keep this focused on farm-related goals. Let’s skip the farm for a second. I know. I said I wouldn’t but just play along. I need to be a better farmer. That’s more than just muck and muscle. It’s a lot of muck and muscle but it’s more than just muck and muscle. I need to spend some time expanding my education. This will help me be a better husband and father, not just a better farmer. So in 2015 I intend to read a book each week. I suspect I currently read more than a book per week but I don’t journal it anywhere. So I’m going to read at least a book each week. Maybe I’ll add that as a blog feature. Dunno. If you want to play along, the youngest two got me Bob Kleberg and the King Ranch: A Worldwide Sea of Grass for Christmas. I’ll try to finish that up before the new year. After that? Could be anything. I’ll try to come up with some sort of plan and I’m open to suggestions. Beyond that I could list a large number of specific things Julie and I want to accomplish this year but I find that by doing so I’m not setting goals for 2015. I’m writing a year-long chore list and that’s not what we want. Today I want the big picture. Once I see that clearly I’ll know what to do next. From a big-picture level…what is it I want in 2015? Health. Family. Friends. Money. Liberty. 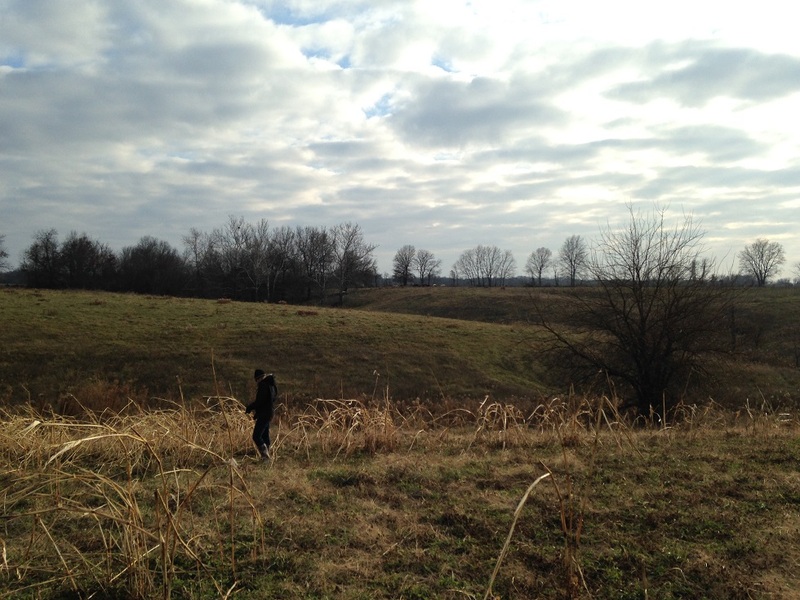 What am I going to do to accomplish that on the farm in 2015? I am going to increase my farm’s stocking rate. Until my farm is stocked my business suffers at every level. So does my family, my wallet and, in some way, my health. How many cows? What about sheep? Should we start to farrow? Dunno. We’ll do our best. Stay tuned. I am going to read like it’s going out of style because I’m afraid it is going out of style. There is just too much I don’t know. Too much I haven’t seen. Too many ideas I haven’t weighed. What one non-surgical thing can a person do to make themselves more attractive? Read. Not only books, I want to find 5 more farm blogs to patronize starting with Bruce. The farm has a number of infrastructure needs. However much I don’t want to write a chore list, I have to include chores in my list. Without being specific here, I need to list the work that needs my attention, prioritize it and start knocking it out. 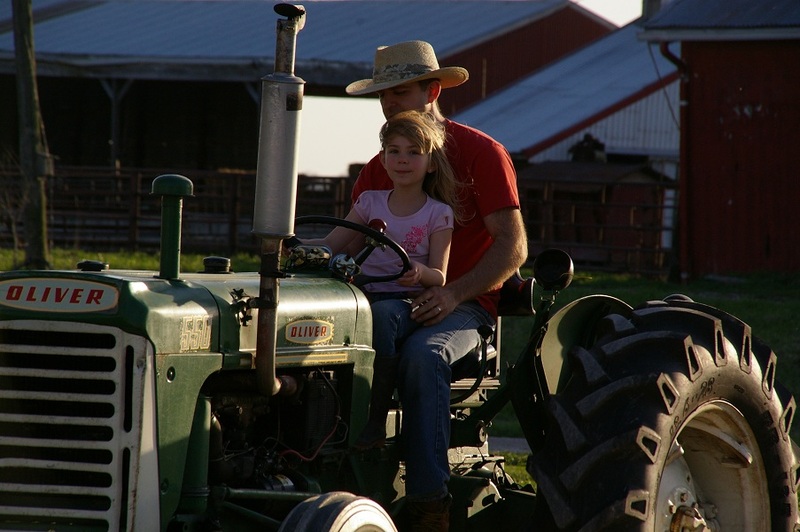 I plan to pursue better stewardship of our farm and family finances. I played terrific offense this year but our defense was a little weak. We need to step it up. You can read about budget and finance elsewhere. I just need to do better. Really, this includes manure and compost management, not just money. To be more personal for a moment, Julie and I hit some rough spots in 2014. Nothing that endangered our marriage but certainly caused us real stress. She can’t move a chicken tractor. She can’t carry feed sacks. 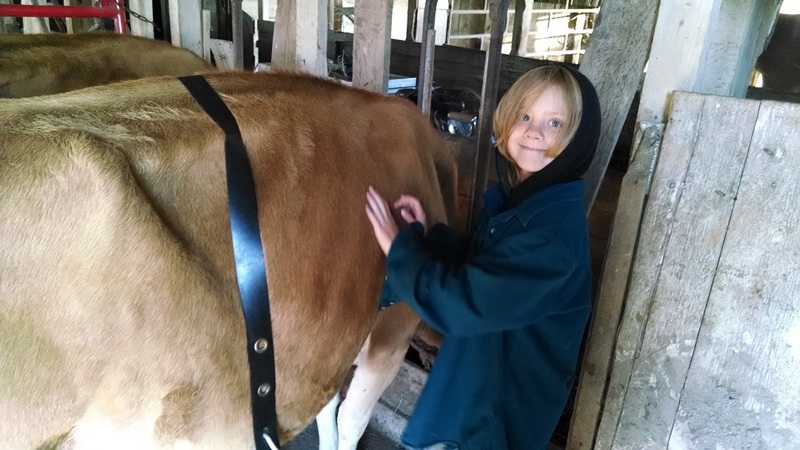 Milking is not her favorite activity. 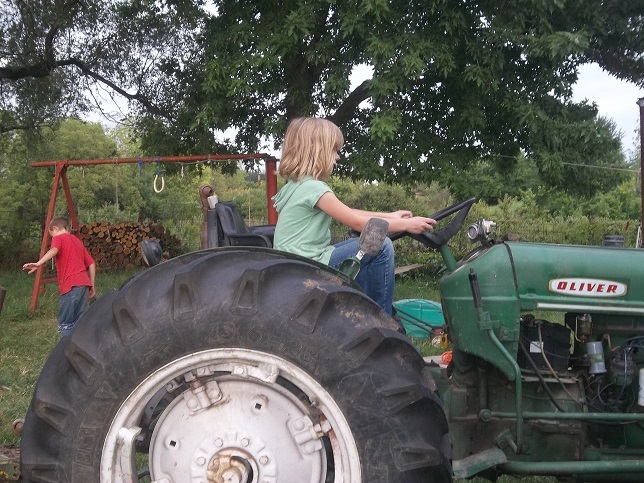 We need to focus this year on what she enjoys about the farm and find ways leverage those interests. Similarly, the kids. A previous bullet point discussed farm infrastructure needs. My kids are the farm’s infrastructure. I need to keep them in good repair. I need to make sure they are a part of the farm, not merely involved in the farm. I need to make sure my family has been inspired to pursue a common vision. And that vision starts here. We work together as a team to steward God’s resources, create a welcoming home, share with others, encourage one another, learn and explore new ideas and pursue our God given purpose. In 2015 I will be a better husband, father, scholar and steward. I don’t have numbers for most of those metrics but that’s the direction to go. Please comment below to offer suggestions on worthwhile reading, both books and blogs. We finished up chores early after staying up late last night wrapping presents and watching old episodes of Dr. Who. Usually Julie and I watch Better Off Dead as we wrap presents but this year Dr. Who sounded better. Every year we get the kids wool socks, a box of cereal (we only buy cereal at Christmas) and a book. Don’t tell them until tomorrow afternoon though. However, my sister and I have a little tradition on Christmas Eve. The aforementioned Better Off Dead made a big impact in our childhood. She has given me TV dinners (I remember how much you liked the brownie in that one). I have given her a framed picture of Ricky (so she will always remember her trip to the United States). There have been threats to make aardvark coats but the gags don’t stop there. For years we traded a can of spam back and forth. She gave me Santa boxers one year. I gave them back the next year (unused). What’s it going to be this year? Is there a gag? I can’t tell you. That’s my most favoritist part of Christmas Eve. Not knowing what I’m in for and watching my sister open gifts from Julie and me with a measure of reluctance. Good times. My favorite Christmas movie isn’t really a Christmas movie but it inspired something of a tradition. Fescue. Cool season grass. Puts on massive growth in the spring and again in the fall. In the heat of summer it gets infected with fungus and is not a good thing for the cows to eat…at least not in isolation. It can make tips of tails fall off and cows can lose their hooves. Bad mojo. As part of a balanced breakfast though, it’s OK. We try to keep a good mix of clovers and warm season plants growing to dilute the worst of it. 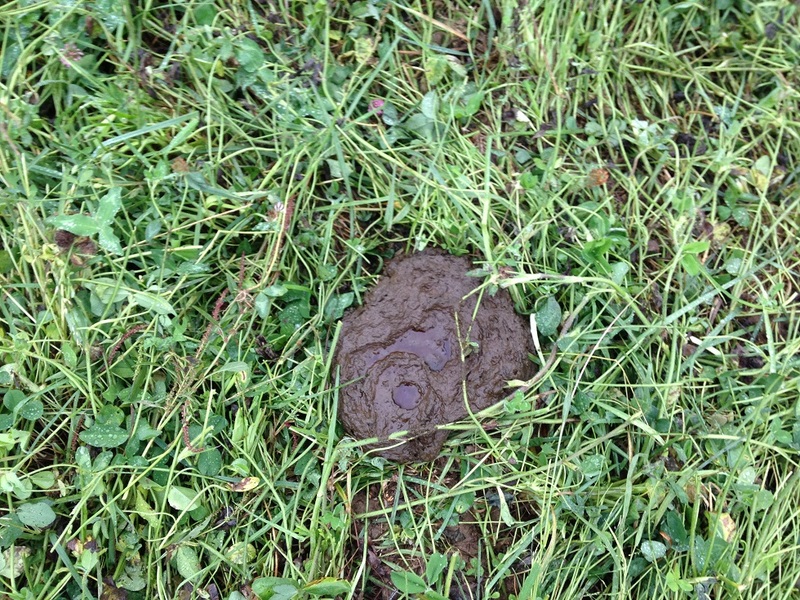 There is some thinking that cattle genetics play a part in fescue tolerance. Dunno. When the alfalfa field ends the fun begins. You already know the players involved, let’s take a look at the game board. Starting things off this year is the hill just east of the yellow house. This hill has been resting since summer and is ready to play. Well, maybe I let it sit a little too long. Let’s look at it a little more closely. The green is good. 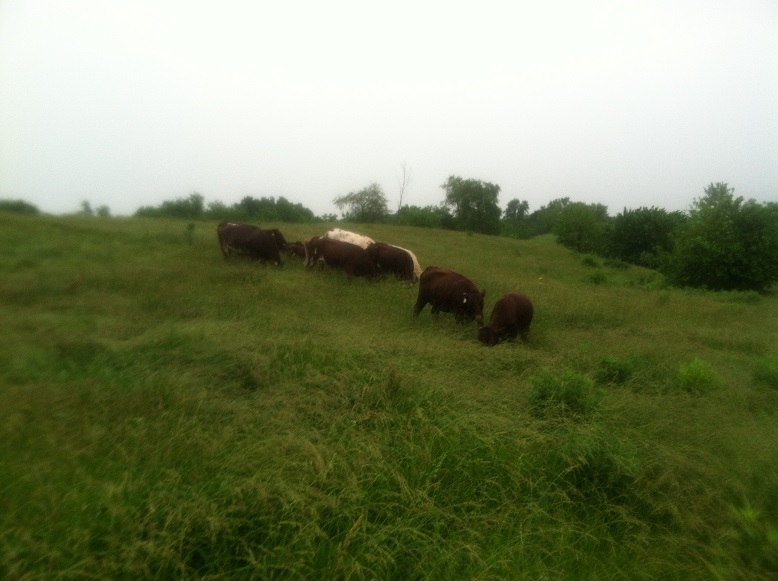 The cows will eat all of the green and because fescue is waxy, it will stay green for most of the winter. A fair portion of the brown will be eaten too. In fact, if I would supplement their diet with protein (and I may) they will eat the majority of the brown too. Otherwise it will be shoved into the dirt in mass. How much mass? Here’s a bundled up, heavily layered, rubber booted Julie to show you. 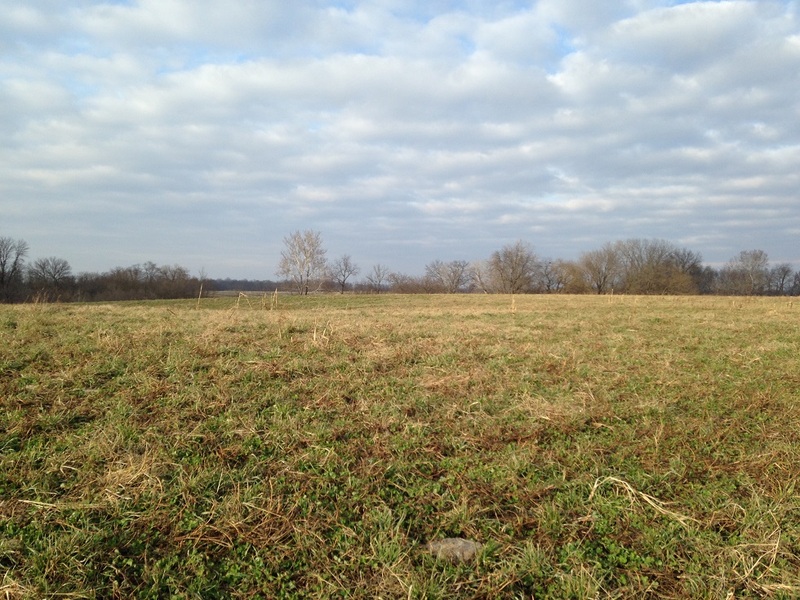 all the way over to here (the clover field we grazed until October). We will do this by grazing from south to north in narrow strips from west to east. Hopefully we’ll have two months worth of grazing here supplemented by a bit of hay cut from the clover field I am standing in. Good soil coverage. Good contact between litter and soil. Some amount of recovery. Some amount of residual feed. If I get in a bind I could graze these 9 acres again but I would have to move the cattle quickly. It’s just nice to have insurance. Lots of rabbit trails in this post. Why stop now? You wouldn’t believe the deer in this field. Geez. They bent posts and knocked down fence every morning. The hill to the east…um…this is getting confusing. See Julie standing in the shattercane several pictures up? (Look, I know I shouldn’t have shattercane, OK?) 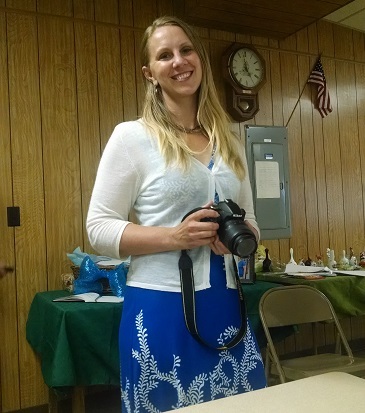 OK. She is south of me (Chris Jordan, photographer, farmer, gentleman, scholar). The cows are further to the south in the alfalfa field. On the left side of that picture, up on the flat, the cows grazed in the spring then dad and I cut some of the best hay we put up last year. Just wonderful stuff. It was hard to get there as the hills are steep and the valleys are deep but we cut the flat top. Oldest boy and I had to cut and drag brush ahead of dad when he was mowing. Not only was the hay wonderful stuff, I came back with I don’t know how many loads of manure and lime and covered the field. 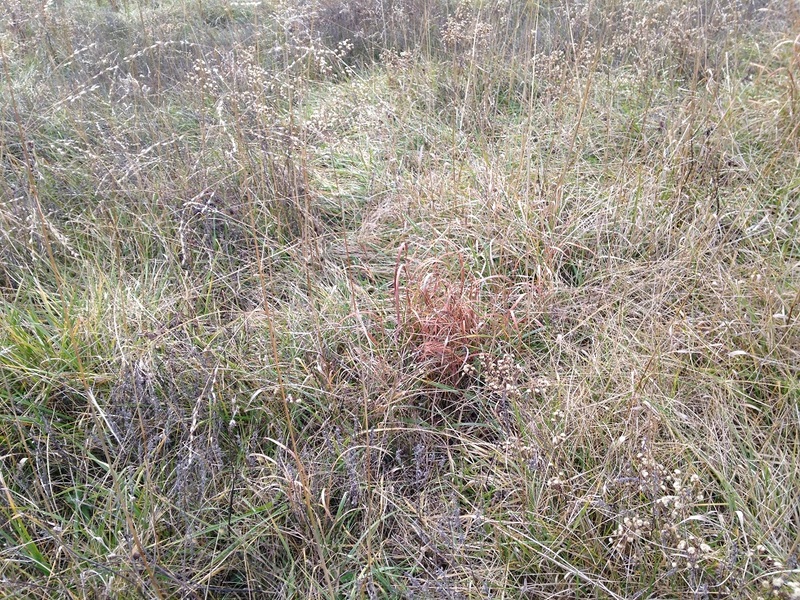 It recovered nicely and is now free of brush…like the thorny sapling pictured further up. You can see a line on the field where the mower ran. I think this is a practice we will continue. 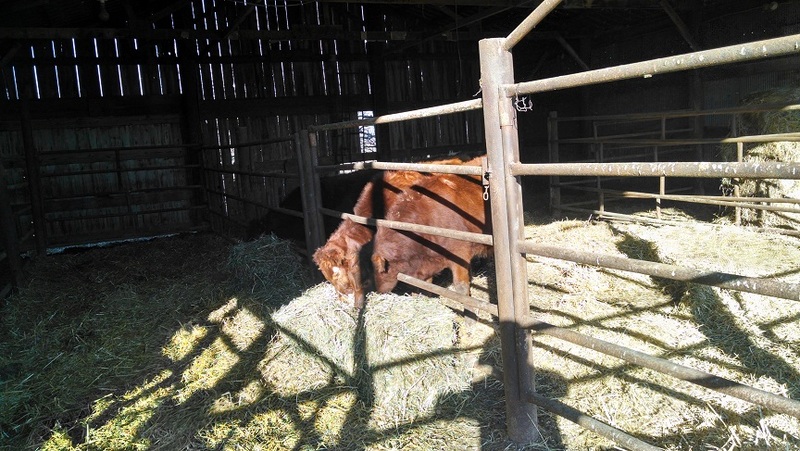 By taking a single cutting of hay and applying amendments from each field every few years I can mix up the level of disturbance in my fields…also it gives me a chance to manage things even more closely while also supplying me with the feed we need. Looks good on paper anyway. OK. So. Now. 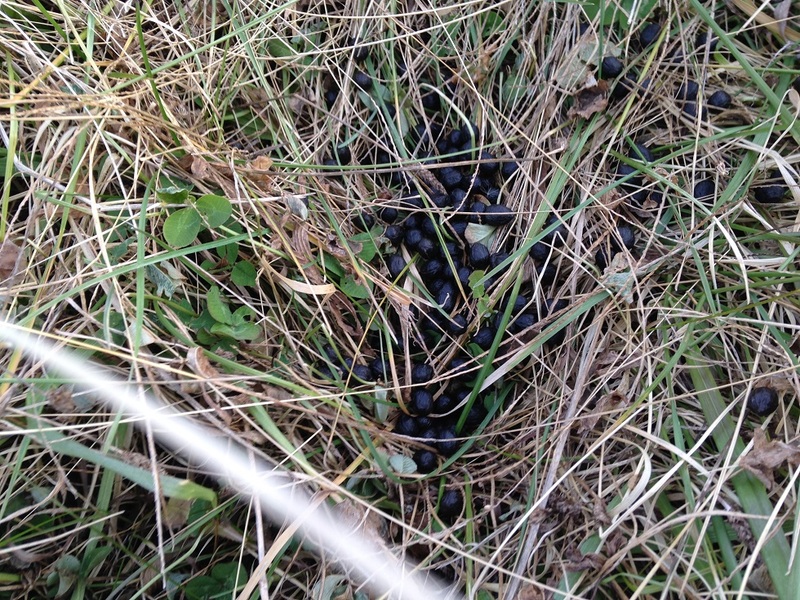 How long can I keep talking about fescue and running rabbit trails in a blog post? Do you really want to know? It’s not just fescue out there. There are perennial warm season grasses growing out there too. Unless I am mistaken, that’s big bluestem growing in the center. I didn’t plant it. It just showed up here and there in this field. 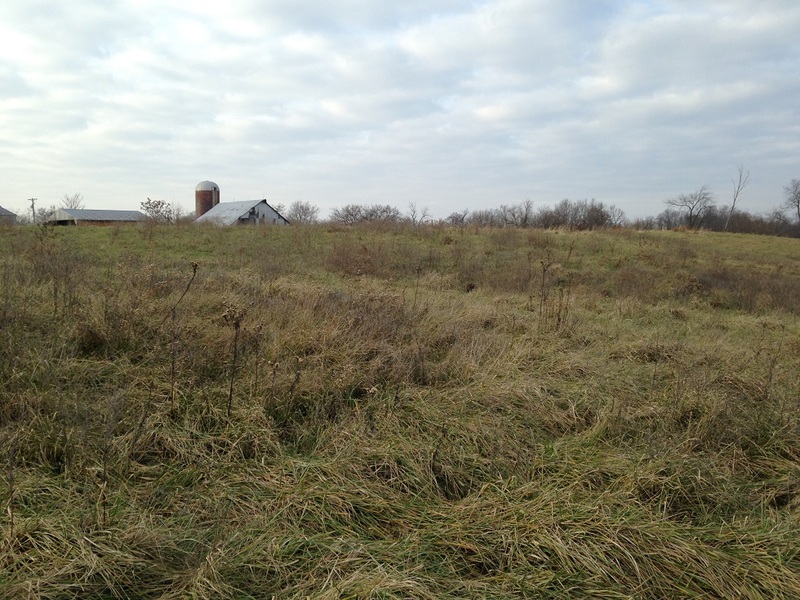 The cattle were probably never in this field when the bluestem was growing. 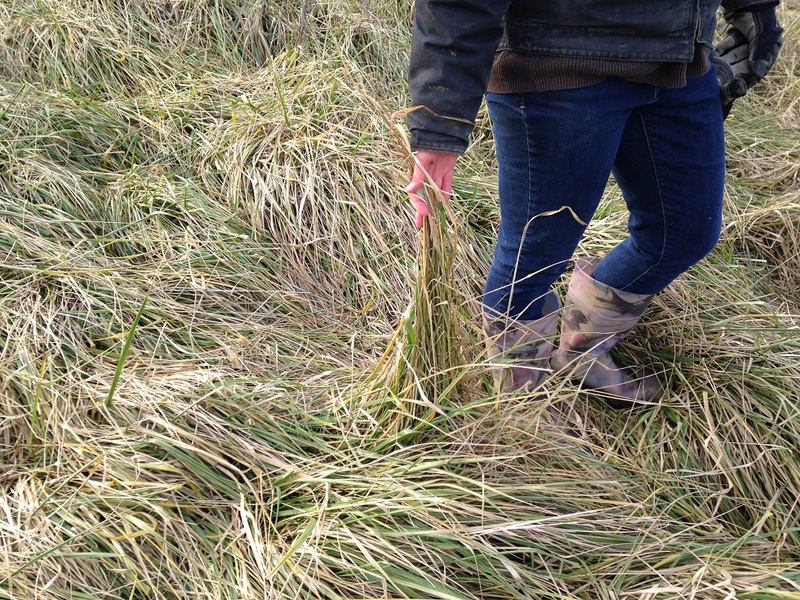 How many years has it been since these grasses were allowed to grow? 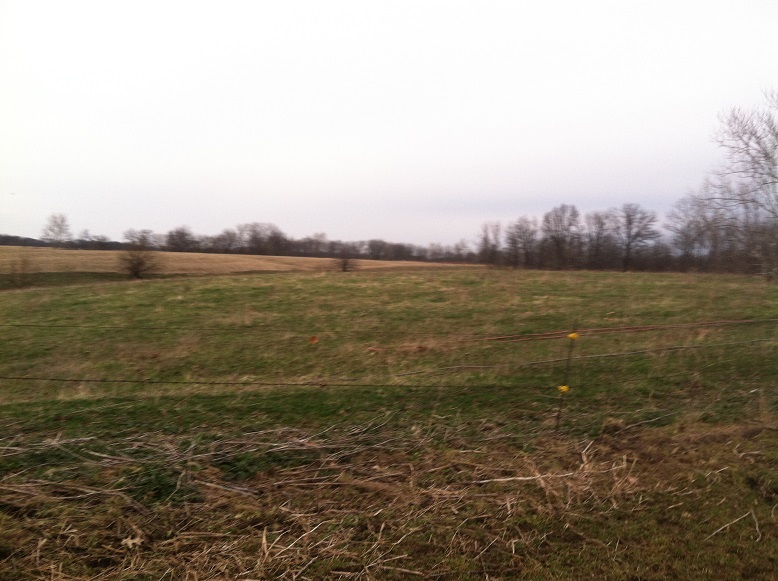 We covered about 15 acres in pictures today. 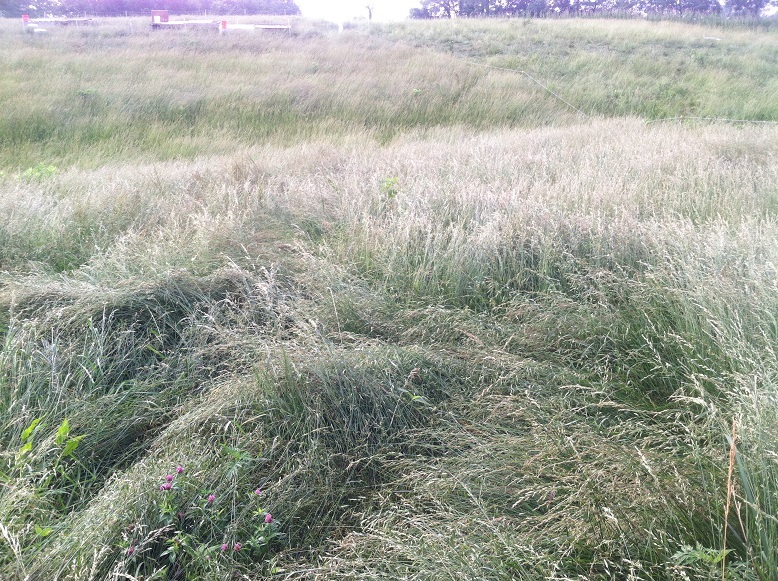 Some of our fescue looks a little raunchy so I’m worried I’ll have to feed more hay than we expected. There are places where the chickens manured that the fescue looks better. In coming years I need to leverage my chickens more completely but it’s hard to get them to some of the remote hills. Building a pond out there will really help with field access. (Someday…) It is encouraging to see the increasing diversity of plant material. Last spring this field was defined by bare places between plants. 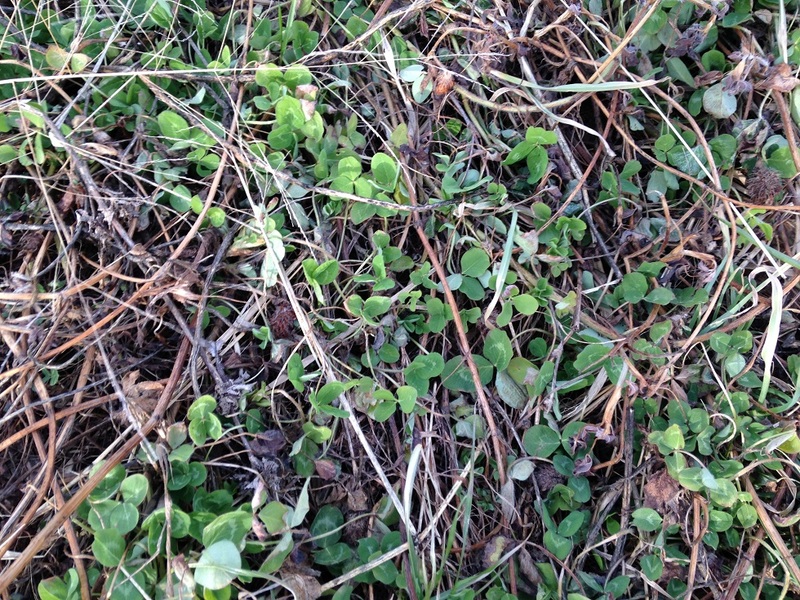 Almost no clover anywhere. No residue on the soil. No manure to be found. Just short grass and bare soil as it looked last April. But that recovered to a thick carpet of fescue. Almost nothing but fescue. Yuk. We grazed it lightly. Then again. Look how fat they are! Then we went away for the summer and fall. Now I am relying on my savings. Will I be totally hayless? Nope. But the urine and manure will be delivered all over the farm without mechanical intervention. The cows will be harvesting the majority of their calories without mechanical intervention. They will have fresh greens to eat all through the year and the soil will remain covered. If things work out, I should have greater diversity, increased fertility and increased drought resistance in the upcoming growing season. And fat cows. It looks good on paper anyway. We’ll talk again in April. Those are weak titles but the best Julie and I could come up with. Dive straight into the comments if you have a better idea. I think the “Strolling…” series should make a comeback in 2015. My plan was to wean in the spring so the calves could have a little bit of milk as they grazed stockpiled grass through the winter but I’m cornered and have to change my plan. My cows really aren’t adapted to grass and I question their condition as we head into winter. So here goes. As usual I’m trying something I have never seen anybody do in real life. Cause that’s how I roll. It ought to work. If you didn’t watch the videos, I want to point out there are no spikes on these. They are just flat plates that you put in the calve’s nose. 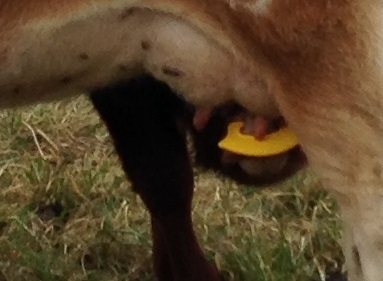 One calf responded negatively to having something yellow on his face he couldn’t escape from but didn’t appear to suffer any other discomfort. On Christmas day the calves will be separated from the cows. More chores. Yeah! Dad and I were checking things around noon yesterday and it looked like Henry was nursing in spite of his jewelry. Upon closer inspection though, he was just standing there looking frustrated. I recently played with the logistics of an attempt to mob graze the entire state of Illinois and threw out big, meaningless numbers along the way. Let’s add a little meaning. These first two show some pretty big mobs. Watch the animals move. They just keep coming. This one though…this one is ridiculous. I imagined grazing cattle through the state of Illinois. How about driving cattle from North Australia to South? Illinois is only 600 km long. These cattle went 1500 km. And if you want more detail on moving 18,000 cows through Australia…well, here it is.